Is Wrike The Easiest Project Management Software On The Market? Wrike is definitely one of the easiest project management tools on the market. It is quite simple to navigate, easy to learn, and does not require any technical knowledge. Its dashboard gives you a clear view of all your tasks, highlighting those nearing their due dates. All tasks can be accessed with just one click and rearranged easily with Wrike’s drag-and-drop interface. It is a fact that project management software has changed the way businesses handle their projects. But the truth of the matter is your company may have the greatest project management software solution on the planet, but if your employees don’t use it, then it simply defeats the purpose of purchasing one. User adoption is important to any business, and for it to become prevalent in your organization, your software must be easy to use while promoting communication and collaboration among team members, functionalities that are critical to any project’s success. Here, we’d like to share some key considerations you should keep in mind when looking for a project management solution that is easy to use. Our top choice being Wrike, we will also present other top project management solutions from 2019 that our B2B experts found to be really easy to use and adapt for comparison. That way you get to put our review into context based on your situation.  Definitely the best and easiest project management software solution out there. 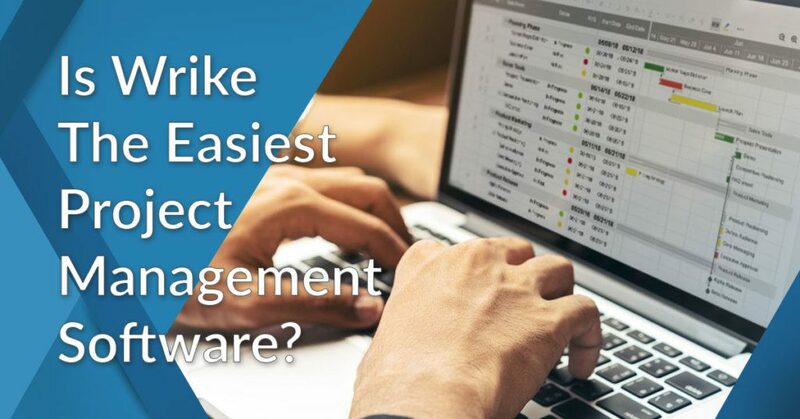 Among the numerous Wrike features, what catches the eye is the fact that it is a simple looking tool which runs very fast and at the same time streamlines many processes associated with project management. When you want the job done quickly and easily, you should get Wrike. The tool’s developers have done a good job ensuring that Wrike’s UI is functional and easy to learn. It is partly because of it’s easy to learn and understand yet rich and useful functionalities that Wrike is considered the best project management software by both users and industry experts. After careful and thorough evaluation by our own B2B experts, Wrike was distinguished as the very best product under our project management software category. There is a free trial plan if you want to try out the key features for yourself. You can easily sign up for a Wrike free trial here. Most elements you can find within Wrike are fairly easy to see, eliminating any confusion on the part of the user. The dashboard gives you a quick overview of pending tasks, with a special focus on tasks that are almost due or overdue. Users can click on the tasks to bring up details, view or add notes, attach documents, change the importance and status, etc. In addition, the sections on Wrike’s Dashboard can be easily rearranged via a simple drag and drop, aiding greatly in the organization of your projects. Wrike’s Activity Stream is also extremely well set out and simple to understand. Another prominent strength of this project management tool is its capacity to easily import, export, as well as integrate with other software solutions. In addition, Wrike allows you to quickly attach files to tasks. While many project management tools allow this, Wrike goes the extra mile by including the capacity to upload crucial files from Google Docs. This can serve as a huge timesaver for your business if many of your files are stored on Google Docs. Wrike enables you to manage large volumes of tasks by using a native job number system, eliminating the need for third-party software. Tasks automatically receive identifiers to make it easier for you to identify and reference them. The system’s dashboards have also received a facelift, becoming even simpler to use while enhancing sharing capabilities. Dashboards can even be created directly from templates that come with the software. These templates are very helpful especially to those who have no idea where to begin. After analyzing all the popular project management solutions our B2B experts found Wrike to be the easiest one to use and adopt. Wrike’s system is well set out and easy to navigate. You can find more information about this service, including a thorough analysis of its features and benefits, in our Wrike reviews. You can also try out the tool on your own with the Wrike free trial plan. 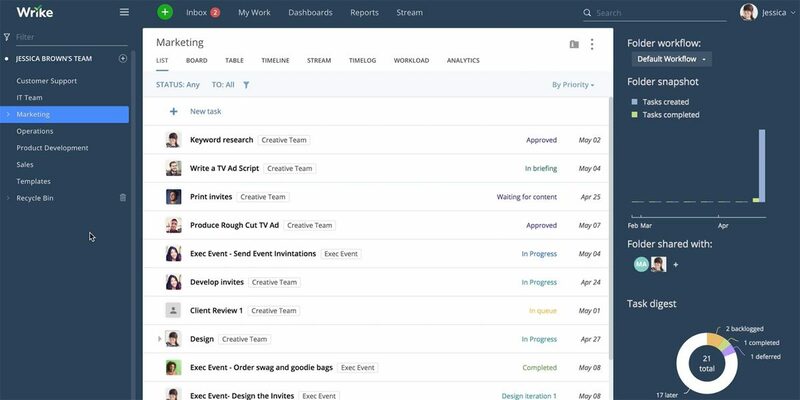 One of the leading project management solutions in the market, Monday.com is designed to boost communication and collaboration among project teams. The software syncs all project data in a single location, which can be accessed by relevant parties. It organizes project data in a logical manner so that they can be easily understood by all team members, helping them monitor all aspects of their projects. You can find a Monda.com overview in our detailed review of the product. The system is easy-to-use, requiring minimal training and can be used even by novices. However, if you need help navigating the app, the vendor offers training materials via YouTube and its official website. Monday.com also boasts robust scheduling features, helping you get a handle on project and task management. This likewise cuts down errors associated with manual data entry, not to mention it eliminates the tedious paperwork. It plays well with other apps in its category while being able to scale as your business grows. If you want to take the platform for a spin, you can easily sign for a free Monday.com trial here. Another project management platform known for its ease-of-use is Clarizen. It comes with enterprise-grade tools that combine project management and social engagement capabilities in a singular platform. This capability allows the software to align project teams towards realizing their goals, from conception to execution. It is not only easy to use but equally effortless to deploy. The system’s popularity lies in its ability to link projects, tasks, and conversations, paving the way for effective collaboration. It also connects structured with unstructured work conversations. Learn more about Clarizen benefits by reading our comprehensive review of the software. The app accelerates the way businesses manage initiatives, projects, and work. It accomplishes this by prioritizing resources, budgets, portfolios, projects, and tasks, ensuring that data management is at optimal levels. Project planning likewise gets a boost when you use the solution as communication among both functional and operational managers are improved. More importantly, Clarizen allows project teams and ordinary staff to take part in advanced project management, thanks to its highly-customizable and socially engaging interface. And since it is mobile-optimized you can access the system anytime, anywhere. Perfect for those working in the field. You can experience the product’s features firsthand by signing up for a free Clarizen trial here. Cloud-deployed project management software ProjectManager.com is a tool known for its simplicity yet powerful features. It essentially mixes scheduling, project planning and collaboration tools to help teams complete and deliver projects on time. Its capabilities include project planning, resource and asset allocation, task scheduling and project tracking, all of which is accomplished using a singular dashboard. This highly-dependable platform is highly-suited to projects big and small, the reason for its popularity. The solution is equipped with tools to manage and track your projects, keeping you updated at all times. Scheduling is quite easy as the system comes with drag-and-drop functionality, allowing you to even make changes to due dates. You can likewise collaborate on tasks with colleagues, attach important files and add comments to point out issues. Your team members need not be at a loss when it comes to project details as the tool’s collaboration features ensure that they are always on the same page. Customization options, meanwhile, let you set the system according to your preference, allowing you to work the way you want. More ProjectManager.com pros and cons can be found in our review of the platform. You can find out more about the tool’s features if you sign up for a free ProjectManager.com trial here. Cloud-based task and project management software MeisterTask is designed to help managers take control of all aspects and stages of their projects. Such is accomplished by the collaboration and project progress tracking capabilities that come with the solution, resulting in increased productivity and on-time delivery of projects. Project management functionalities include automation, Kanban dashboards, integrations, and reporting. If you’re wondering how much the tool costs, find out about MeisterTask pricing by reading our review of the system. With MeisterTask, you get to streamline your workflows to suit your needs as its project boards can play well with your existing workflows. Critical data such as pending and completed tasks, daily reports and project overviews can readily be viewed from the system’s customizable dashboards. You and your project team are given the capability to download, upload and share files whenever the need arises. It even supports discussions where you get to share ideas when brainstorming on projects. The solution has extensive third-party integrations, which give it added features and functionalities. You can easily sign up for a free MeisterTask trial here. Most intuitive project management solutions share a set of characteristics which makes them easy to use and accepted by even the least tech-savvy user. You can use these elements as metrics when evaluating a software product in terms of usability. When getting a new project management software program, familiarity is crucial. You do not want your company’s employees spending a lot of valuable time orienting themselves with the ins and outs of using a new program. If the tool’s UI proves to be far too difficult to understand, let alone use, your team members may give up and not use the tool at all, defeating its purpose entirely. You should get a project management software that has familiar and easy-to-understand icons and toolbars. Today’s team members use their tablets, smartphones, and other mobile devices as part of their corporate arsenal to get work done. Many employees will want to use the project management software program or some of its features while they are on the go or doing work in the field. In today’s business landscape, that is the mantra of “anytime, anywhere”. That is why one of the major factors that you should consider when selecting a project management tool should be mobile access. Another important consideration is to check the features you can have in a project management tool if it is accessible on a mobile device. For instance, to what extent can you make changes from your mobile device? Can your employees just check and view the files or can they collaborate and make changes as well? Are your tool’s features limited in the mobile version? If they are, what does this mean to your company’s productivity? Make sure you check all the mobile features a project management solution has to offer. A project management software program should be intuitive. You do not one that reinvents the wheel. In your company, you simply need a solution that does not need a lot of training and time to get started. When it comes to simplicity, it does not necessarily mean the project management tool should be robust. You just need a project management solution that is relatively easy to use, ensuring its quick adoption across your organization. Look for a project management software program that allows you to have a customizable project dashboard and individual user dashboards. Get a solution that will allow you to assign tasks to end users and quickly see the status of your tasks and projects in a single view. The product should also provide your companies with a quick and easy manner to create project to-do lists for your team members as well as collaborators. One important consideration you should have is the capacity to export project views for your executive presentations. In most cases, project managers are asked to submit status reports to their executives. Most executives prefer getting information or data in a format or program they are familiar with, like Excel or PowerPoint. Thus, it is crucial that the project management solution you’re getting can not only print PDF and Microsoft Excel files, but also export the formats you use. After all, there will be crucial information contained in the project management program you are getting. You will want to be able to share data with your collaborators or others in formats that work for them, without the need to recreate the information in another program. When considering a project management solution, you should get one that can increase collaboration among your team members, creates visibility into the status of your projects, and generally speeds up work. In addition, collaboration is about ensuring end users on various platforms can work as well as access the same file. When your team members can actively look at as well as simultaneously edit a project, it can save you a lot of time. A good project management solution can likewise eliminate various issues associated with version control, as your project files are emailed across the company. So what have we learned so far? Now we know that project management software can help in every stage of a project’s lifecycle. They help you plan, execute and see your projects realized. This is made possible by these tools’ ability to support communication, promote collaboration and track project progress. But what’s more important is that many of these platforms are designed to benefit your business almost immediately as they come as intuitive as can be. The products that our experts evaluated came out on top in terms of ease-of-use. But there is more to project management tools than simplicity and ease-of-use, the ideal platform should likewise allow you to access the system using your mobile device. This means that you won’t have to be in the office just to check on the progress of your projects and tasks. It also enables you to view how productive your project team is. Mobile-optimized systems abound in the market, you just have to look around and take your pick. By now you may think that you’re ready to purchase one, but don’t dive into a deal just yet. Take your time to know what features and functionalities an app has to offer. You can do this by going for free trials and taking a product for a spin. You can also read user reviews and see for yourself what other users have to say. Remember, you don’t have to go for the one with the most features, just focus on what you need and you can’t go wrong. But if you want one that you can readily use after purchase, you might want to consider Wrike. If you want to know more about this software, you can easily sign up for a free Wrike trial here.